Ultimaker polycarbonate is a PC filament for 3D Ultimaker printers. PC Ultimaker polycarbonate can be used on all the 3D printers in the range. This PC Ultimaker allows you to create pieces easily with settings directly pre-set on the machine and Cura software. PC Ultimaker filament or Ultimaker polycarbonate filament is a material created by the brand to be suited to machines without any need for adjustment. 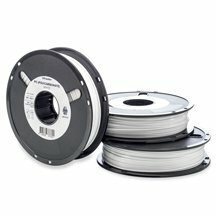 Because everything is automatic, this filament ensures the best possible printing. For purchasing Ultimaker PC/Polycarbonate, choose our shop in order to have all the first choice material available and in stock.